The network gateway for this network is hosted on an inexpensive Linux computer which also stores data from the motes in a data base and serves web pages with trends of the data and other network health information in real time. 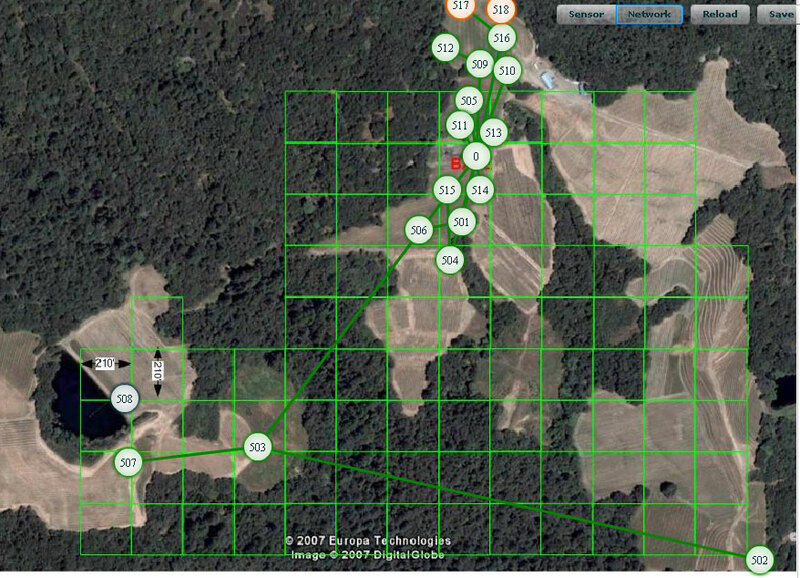 The software from Crossbow is called MoteWeb and is currently running, presenting data updates in real time. My own software which presents the same data but in a different format is at http://63.199.138.244/graphcb.php. Another form of this software is now running which presents data from 4 independent networks of motes some of which are 80 miles apart, all in one page of graphs. See http://63.199.138.244/graphq.php This software provides the most versatile aggregation of data from Crossbow networks currently available. Data is transported across the internet and accumulated in a database on a server remote from the networks. The software connects to the gateway computers for each of the networks and captures the data streams coming from each of them. Multiple copies of this software can run simultaneously on different servers in different locations providing redundancy of data base and data presentation. The user interface can be easily customized because it is simple HTML with forms components. The graph generation code is likewise very simple, being implemented in less than 500 lines of PHP code on top of a library of data base and graphing code written by Tobi Oiteker. Although the frequency of the IRIS motes is higher than the 433 and 916MHz networks at Camalie vineyards their range appears initially to be almost the same, most likely due to improved sensistivity of the 2.4GHz radios used. The distance between nodes 502 and 503 is approximately 2100 ft, about a half mile. This range result looks very promising for their practical use in viticulture. Keep in mind that these motes support packet hopping to achieve larger ranges. Packets often hop 4-5 times to get to the base station. If each hop is 2000 ft. the range capability of the network would be 5x2000 ft. = 10000 ft, or about 2 miles. The motes are enclosed in waterproof cases and are powered by solar cell charged batteries. This installation is a prototype network which is not in the final packaging that this product will have. It has revealed several software bugs and a hardware connectivity problem during its test run thus far. The motes were reprogrammed with new code to support more sensors per mote on 8/13/07. At the same time the mounting of the mote module to the main board was modified. 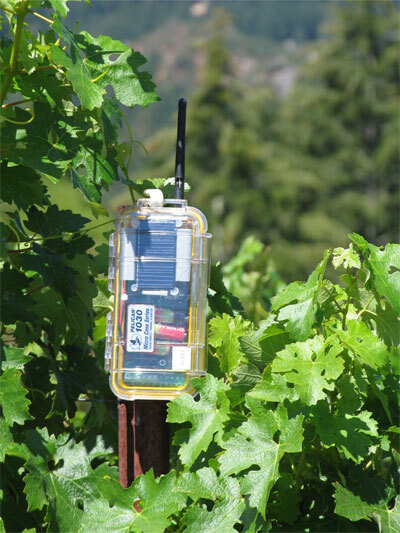 Also on this day motes 516,517 and 518 were deployed in the Staruss-Schultheis vineyard to the north of Camalie Vineyards for range testing. Sensor placement will follow soon. Plans are to further expand the network by another 10-12 motes to fully stress test the networking, gateway, database and web serving software. Last Updated 8/21/07 by M.H.